There is nothing like a good decorated place where you will enjoy your coffee and good conversation with your friends. Most importantly, your cup of coffee has to be on point too. There’s nothing worse than visiting a coffee shop and having poor coffee. That shouldn’t be allowed. With suppliers such as Iron and Fire, you shouldn’t have this issue. Depending on how your coffee turns out pretty much sets the tone for the rest of the day. Fact. Some coffee shops owners decided that having the place decorated in a certain way (with hammocks for example) or have the waiters being dressed like maids or simply let the guests bring their own pets, would make people want to come there more often. And they were right. These are some of the most awesome, weird looking and cool coffee shops you can imagine to have your coffee in. Why sitting on chairs when you can just relax and have a cup of coffee or other non alcoholic drink in a comfortable hammock? Mahika Mano or Hammock Cafe and Gallery, is a popular Tokyo venue that allows guests to do their thing in swaying satisfaction. This heavenly cafe is located in the Kichijoji district of Tokyo. Mahika Mano looks just perfectly with its hammocks that hang from the ceiling, inviting people to just sit back and enjoy a tasty drink. As soon as you walk in, the first thing you notice is the there are no chairs. But as soon as you lay down in one of the hanging nets you wouldn’t even think of a chair. Seriously you wouldn’t even want to go to a regular coffee shop after you spend a day here. The only bad thing is that this place has implemented a time limit of 90 to 120 minutes so that everyone can have a chance to enjoy the hammocks. Yes, there are goats. Sakuragaoka Café in Tokyo in the Shibuya district allows customers to spend quality time with two very special goats. In Japan pet coffee shops are very popular, so the owners decided to make something completely different. Goats are not as easy to take care of as cats who are the city’s favorite pets. The pens get mucked up between customers and the goats are fed special protein-filled pills to prevent them from defecation of smelly droppings. This coffee shop became very popular due to the fact that most petting zoos are very far away from the city, so most visitors are using this opportunity to actually see real animals. One thing is sure – if you happen to be in this café and there is real earthquake you surely won’t even know. 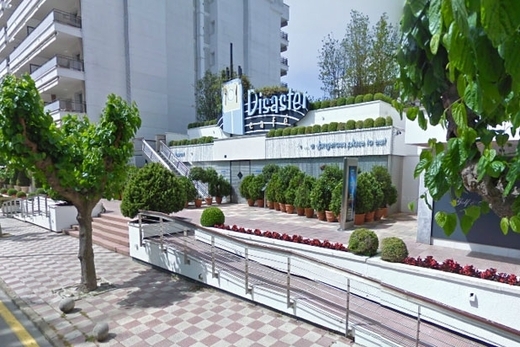 The Disaster Café is located in Lloret de Mar, Spain. Here quakes happen all the time and guests should try to keep their balance and hope that their drinks won’t get spilled. People come here and pay to experience a simulated 7.8 quake while they enjoy a tasty meal. An elevator takes the customers to “the depths of the Earth,” where they’re seated in a cave-like restaurant. The waiters and bartenders wear construction helmets and other safety equipment and that’s how you know that you came on a really awesome place. Once they serve your food or drink, you’ll realize that, for some reason, the dishes are a lot heavier than normal (of course they can’t handle to buy new dishes after each day with simulated earthquakes). Guests are always on the edge on their seats at Disaster Café, because they never know when disaster strikes. Once the 7.8 degree earthquake starts, the lights go out, women scream, the chairs and the tables, and pretty much everything in the room starts moving, and there’s nothing you can do but wait it out and hope for the best. But worry not; there are never any serious injuries at Disaster Café. The only thing you should only worry about is your clothes, because during the quake the food goes everywhere and of course all over you. The heavy dishes will stop the meal from flying off the table, but accidents do happen quite often. Pretty cool, right? In these cafés the waitresses are dressed in maid costumes, act as servants and treat customers like masters (and mistresses) as if they lived in a private home. The first permanent maid café, Cure Maid Café, was established in Akihabara, Tokyo, Japan in 2001, and ever since these types of coffee shops are becoming more and more popular. They have also expanded to countries like China, South Korea, Taiwan, Australia, Hungary, the Czech Republic, France, Mexico, Canada, and the United States. Maid cafés were originally designed primarily to attract the fans of anime, manga, and video games. The image of the maid is one that has been popularized and fetishized in many manga and anime series. Maids will kneel by the table to stir cream and sugar into a customer’s coffee, and some cafés even offer spoon-feeding services to customers. Some of these coffee shops would offer their guests services as ear cleanings and leg, arm, and back massages (but the customer remains fully clothed). Of course that costs more. Customers can also pay to play card or video games with maids. In South Carolina, USA, there’s a coffee shop where everyone pays for everyone else’s drink. Sounds complicated? It all started in 2010 at Corner Perk, a small coffee shop when a customer paid her bill and left $100 more, saying that she wanted to pay for everyone who ordered after her until the money ran out. The staff of course fulfilled her wish, and the woman, who remained anonymous, has returned to leave other large donations every two to three months. The word was spread around the tiny coastal town, so more and more customers started leaving money to pay for others’ food and drinks. Pretty interesting, don’t you think?